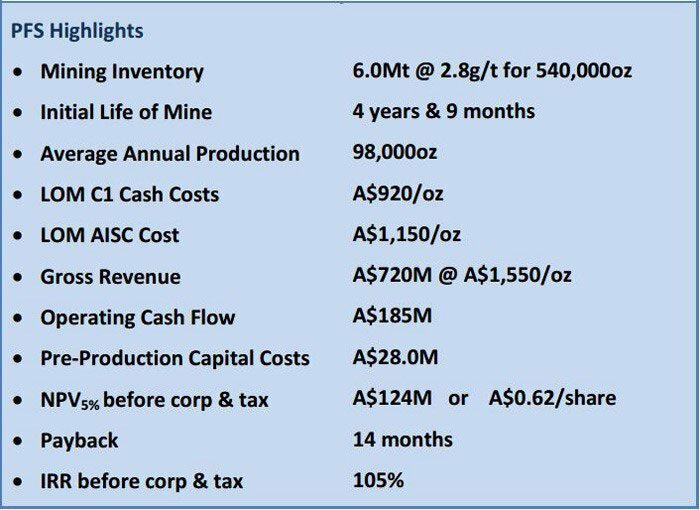 Those of you who follow The Next Mining Boom would know that we have our eyes squarely on Blackham Resources (ASX:BLK) as one of the few companies of its size which offer very real near-term gold production potential. There are plenty of companies out there on the ASX which have a grand vision of producing gold at some point in time, but with BLK, there’s the very real possibility that it could be producing as early as the second quarter of next year. With that time fast approaching, shareholders have been responding. Better yet, BLK is fully funded through to production, meaning it’s unlikely to rattle the tin too much before it starts generating cash for shareholders. At the same time, BLK is a speculative stock, and investors should seek professional advice before investing. It’s just wrapped up a Pre-Feasibility Study into the project, managing to increase the mine life and improve the mine economics, and has confirmed that a Definitive Feasibility Study could in the bag by the end of January. 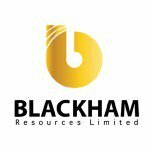 For those of you coming late to the Blackham Resources (ASX:BLK) story, we’ll run through what BLK is doing. For those of you familiar with the tale, stick around. It’s a good story anyway and much like a good novel, the BLK story demands a second reading. 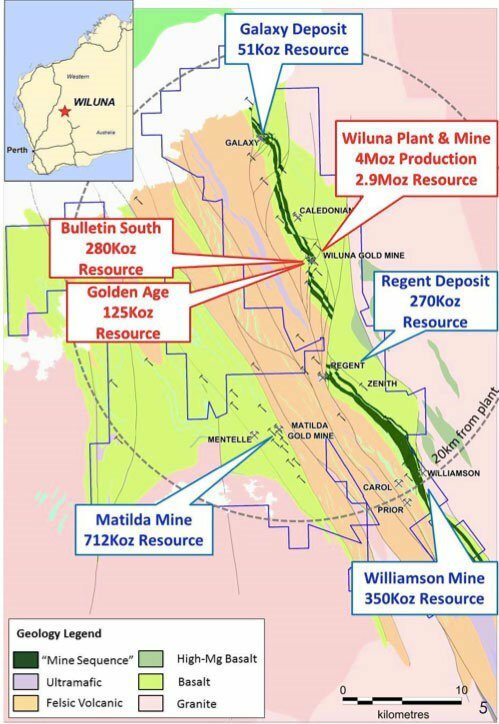 The main project on BLK’s plate is the Matilda Gold Project . Located in the Northern Yilgarn region of WA, the project is in an area with a regional gold endowment of 40 million ounces of gold – but that’s just what’s been found to date. 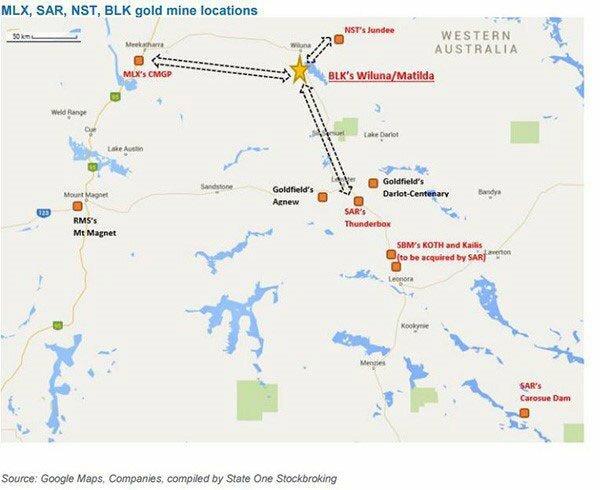 The project has been set up as a series of pits around a central processing facility, the Wiluna Gold Plant, which BLK is aiming to get up and running by the end of the second quarter. When up and running, the plant has nameplate processing capability of 100,000 ounces of gold per year. Now, you’d think that building a 100,000/oz gold facility would cost an arm or a leg, but thanks to BLK’s canny management, it managed to pick up the facility and the project for a song. The plant has a value of $150 million, but thanks to a distressed seller BLK was able to pick up the asset for a fraction of that. The plant is currently mothballed, but just needs a bit of tender loving care to get up to scratch. Remember, BLK is fully funded through to production. The plan is to process the ores dug up using a low risk few milling process – namely crush, grind, gravity, and CIL. At the moment, BLK is beavering away on the sums, folding a raft of recent drilling results into a Definitive Feasibility Study (DFS) which should outline the project economics. However, it’s just wrapped up work on a Pre-Feasibility Study (PFS) which has already improved the economics of a project which was pretty good to begin with. The early numbers on the project, again without the latest round of drilling – make for good reading. BLK has previously estimated that once the Wiluna Plant is up and running, all-in cash costs should come in at about $1,000 to $1,100/oz. As you can see, the PFS has provided an improvement to $920/oz. to $1,150/oz. Given the gold price is currently $US1,148.70 ($A1,597.50), this suggests a strong margin of around $450/oz. However please note – the price of gold can fluctuate – so revenue numbers are no guarantee here. The numbers, have had analysts running the rule over BLK with Analyst Adam Kiley from The Sophisticated Investor recent lifting its valuation from 40c per share to 46c per share on the back of the PFS. That’s a 120% gain from today’s BLK share price. At the same time, analysts can get things wrong, so this valuation may not eventuate. A DFS would provide a touch more certainty on the subject. Before the PFS, it had a mine life of 46 months , but the PFS has beefed this up by 24% to 57 months . That’s a great result on its own, but it doesn’t take into account the recent drilling BLK has been doing to firm up its resource. The PFS also demonstrated that BLK is doing well in upping its mineral resource from its scoping study mineral inventory into the PFS mining inventory. It now has a mining inventory of 6Mt of ore for 540,000oz over the project’s initial mine life. This is a boost of 80,000oz from the Scoping study, meaning in that nine months it’s managed to add on 14%. The resources come from a swathe of deposits including Galaxy, Matilda, and Golden Age. Golden Age is shaping up nicely after recent ‘Bonanza’ hits. These extraordinarily high grade results at Golden Age have not been included in the latest PFS study – and are an upside for the DFS study. 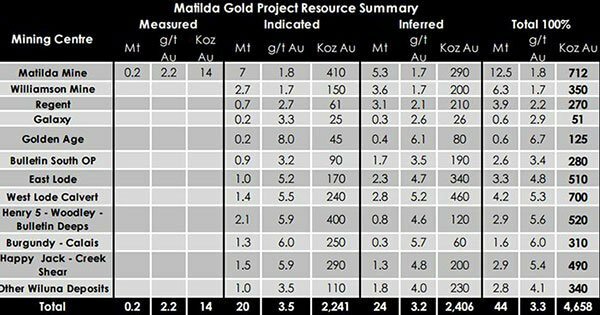 The Matilda deposit is the most advanced of the resources and has a total inferred, indicated, and measured resource of 12.5Mt @1.8 g/t for 712,000oz. Last month it further firmed up its view of Matilda with another round of drilling identifying a number of extensions that could “expand and add further confidence to the free milling, open pit inventory” . This included adding further broad high grade mineralisation at the base of the Matilda pits, with hits such as 14.5m @ 6.74g/ t from 163mF confirmed the pit as a source of free-milling high-grade gold to get the Matilda up and going. Its latest drilling results from Matilda had investors talking, with the spotlight starting to shift to BLK. Meanwhile, it also recently released a slew of drilling results targeting the bottom of existing mining pits at Matilda. Again, BLK continues to keep on doing all the right thing as they advance toward production. Hits included 2.5m @12.84g/t from 80m, 3.6m @ 6.39g/t from 35.1m and 7.5m @3.14 g/t from 7.8m. That drilling justified BLK’s view that the high-grade Galaxy deposits were shallow in nature, starting from the surface. The thing is that none of the above drilling informed the Pre-Feasibility Study, and with the drilling set to be folded into the DFS in January there is significant upside potential in the offing. However, it is just potential right now, and January will ultimately tell exactly what the DFS holds for BLK. We’ve previously leant on analysis from State One Stockbroking suggesting that BLK could be ripe for a takeover. BLK has a potential gold resource of 4.7 million ounces of gold, and with a market cap of $43 million (at the time of writing), implying a value of just $9.14/oz. Compare that with the average transaction value of $46/oz., and BLK really starts to look attractive to bigger players. We can’t help but feel BLK is doing everything right at the moment, and evidently shareholders are agreeing with their buy orders. BLK continues to drill, with its drilling to date – particularly at Matilda and Golden Age – firming up project economics. The latest drilling has not been folded into its latest estimate of project economics, meaning there’s further upside on the way. But BLK is still a speculative stock and caution should be applied before investing. The company has near-term production on offer and should have a regular drilling news flow and a DFS released to the market before production slated for the second quarter of next year. It’s not common of a company to have both.